Education for you and your bottom line! Mark your calendar and plan to join us in Clemson. 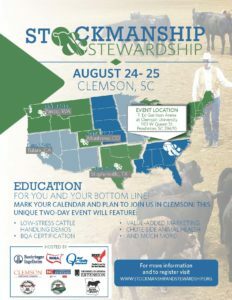 This unique two-day event will feature Low-Stress Cattle Handling Demos, BQA Certification, Value-Added Marketing, Chute-Side Animal Health, and much more! More information available on the Stockmanship and Stewardship Registration page.